I have started my next project, a big ol’ grand pannier for a very cool lady who lives on the east coast. Over this pannier will be the next gown I make, which I will start as soon as I’m through here. 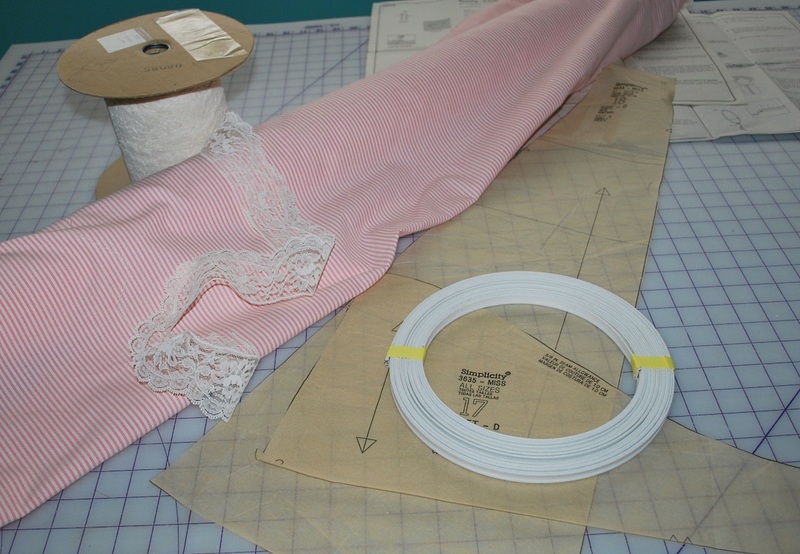 So, I pulled this cute pale pink and cream mini striped cotton out of my stash, and unburied a roll of cream raschel lace and got to work. Stash Buster Alert! Good-bye cream raschel lace! Good-bye cute mini striped cotton! 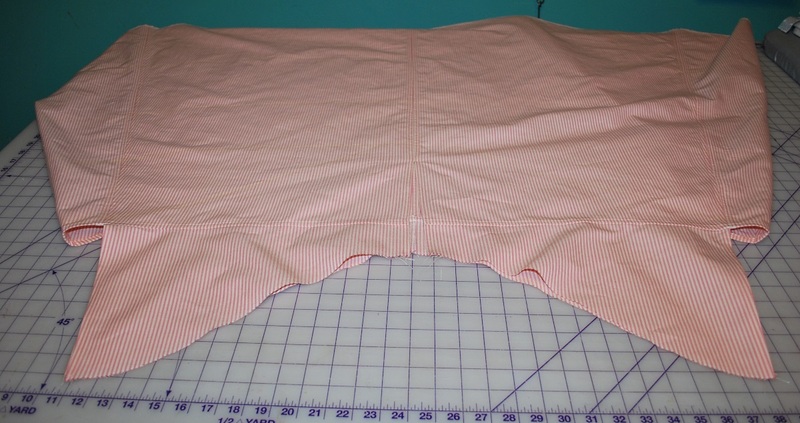 I am using the Simplicity 3635 for this one, it’s a terrrific and surprisingly accurate pattern for a grand pannier. 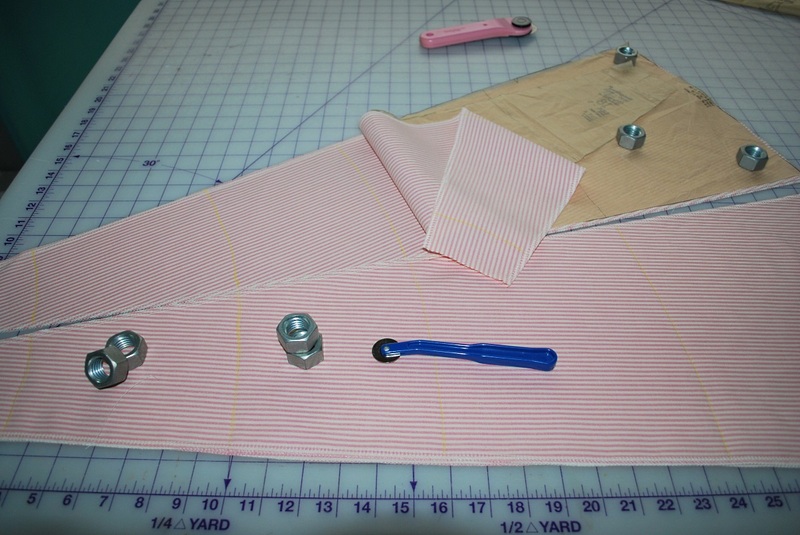 It is now an out of print pattern, and I kind of understand why, it did need some tweaking to fit together better. Well, maybe not, since I didn’t bother to follow their directions beacuse I’m a Miss Know-It-All… but seriously, there was trimming to make a more perfect fit. After cutting out all the pieces, I used the little mini pizza cutter thingy to trace a crease into the fabric where the hoop casing will be, and then traced over it with a yellow fabric chalk marker. 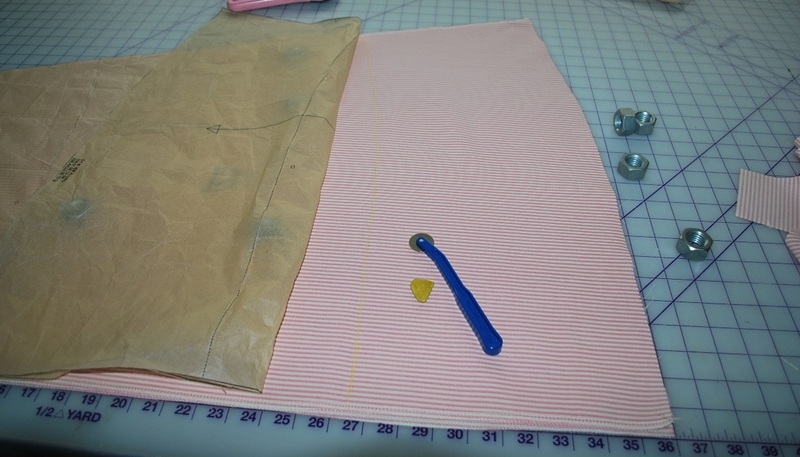 Then, I serged the raw seam edges, and began to sew the pieces together. 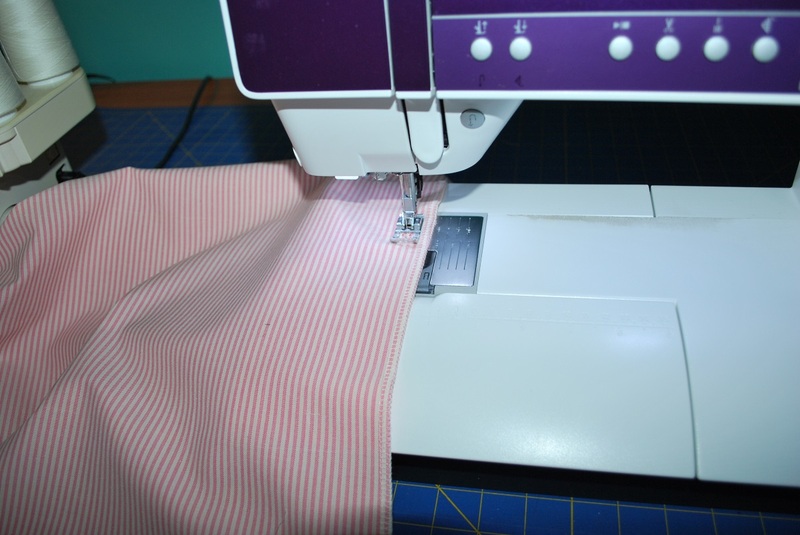 Serging the edges makes it super easy to tuck under the allowance and topstitch it down. 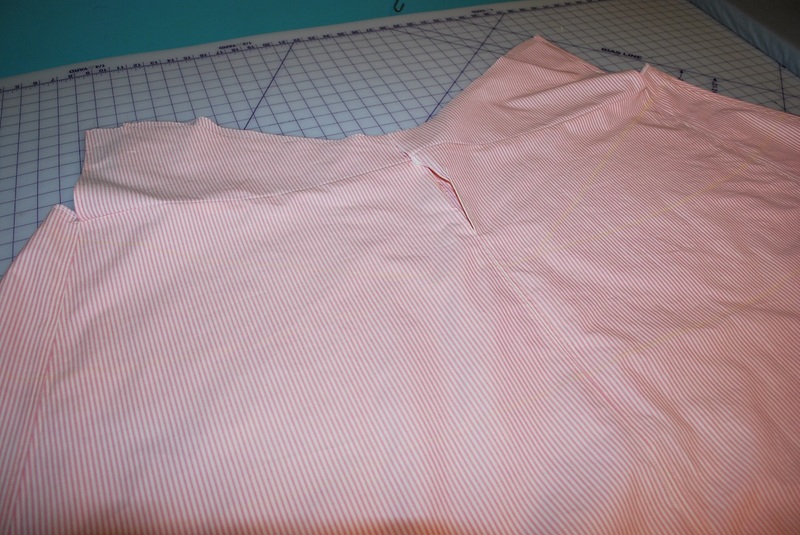 More sewing of long seams… I can’t believe how easy this pattern is going together so far– I don’t even need pins! The fabric is just holding to itself so nicely. That never happens! 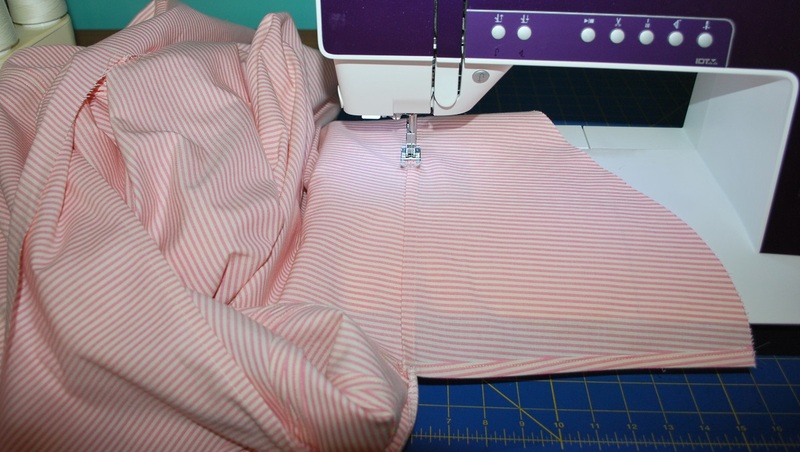 Some bad sewing juju must be waiting for me around the corner, because this is all going way too easily. …and flat-felled it into place. There! 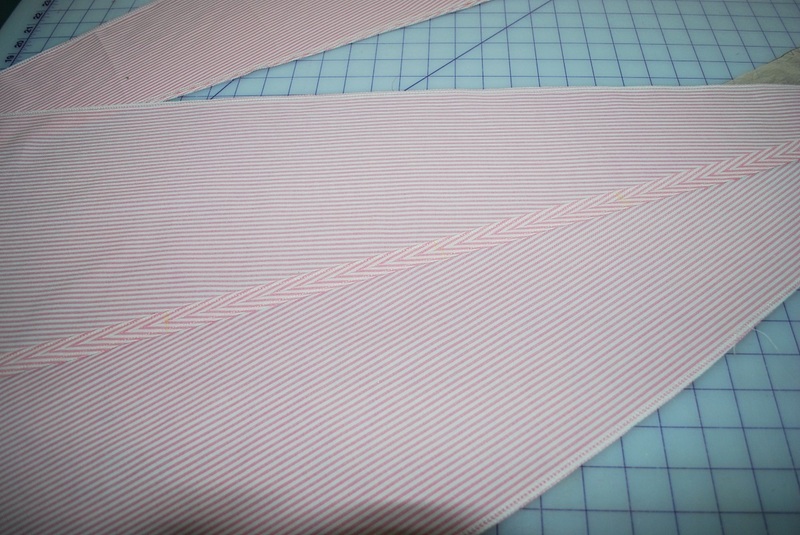 Ready for more tomorrow– loads of bias strips and lace ruffling coming my way. Seriously, I’m so suspicious about how easy this is. Is it because I’m using a premade pattern I don’t have to think about? Is it because it’s such a quick fun project? Is it because I’m enjoying making this great big foofy cupcake looking pannier? I don’t know!